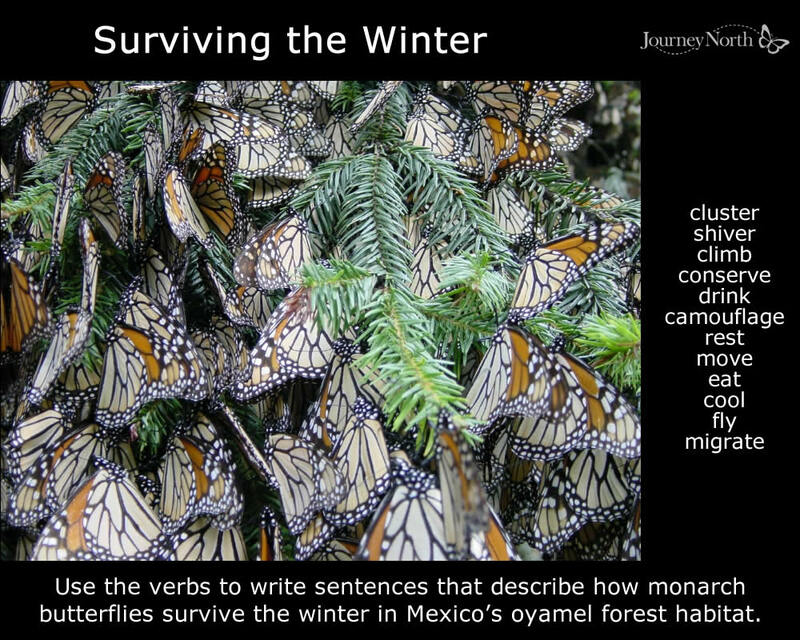 How do monarchs survive the winter in Mexico's oyamel forest habitat? Monarch Butterfly Sanctuary Tour Walk into the monarch sanctuary with the eyes of a scientist. Notice how observations lead to questions. 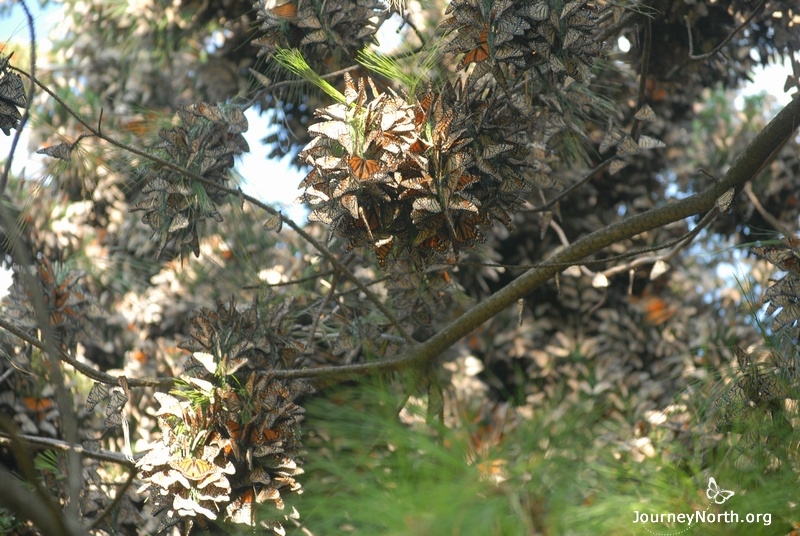 Quiet and Camouflaged Deep in the oyamel forest, a monarch colony can be hard to find. When the butterflies are immobile the colony is silent. 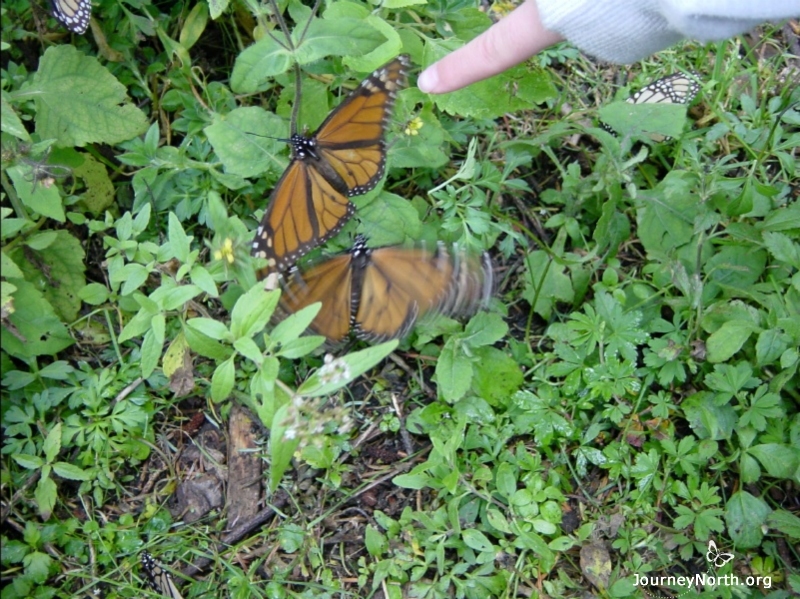 Why do the monarchs fold their bright orange wings? 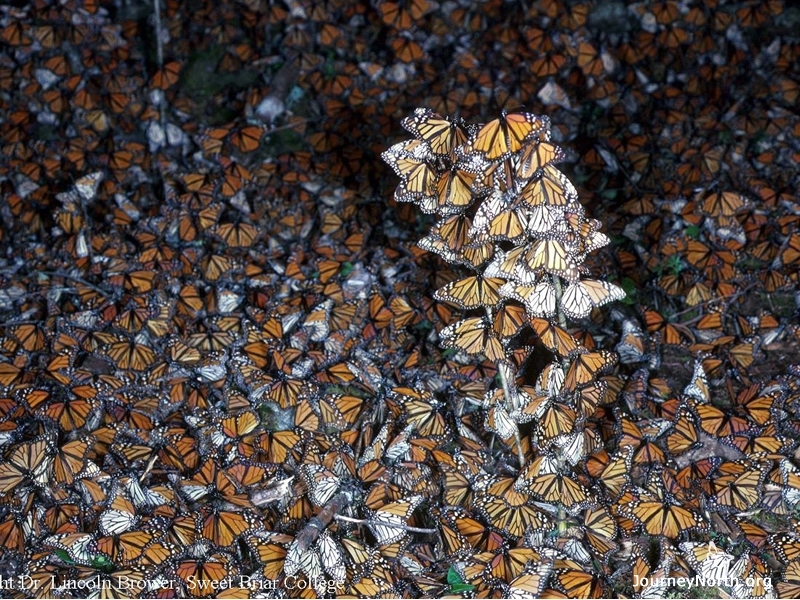 Millions of Monarchs The monarchs in a colony crowd together tightly. 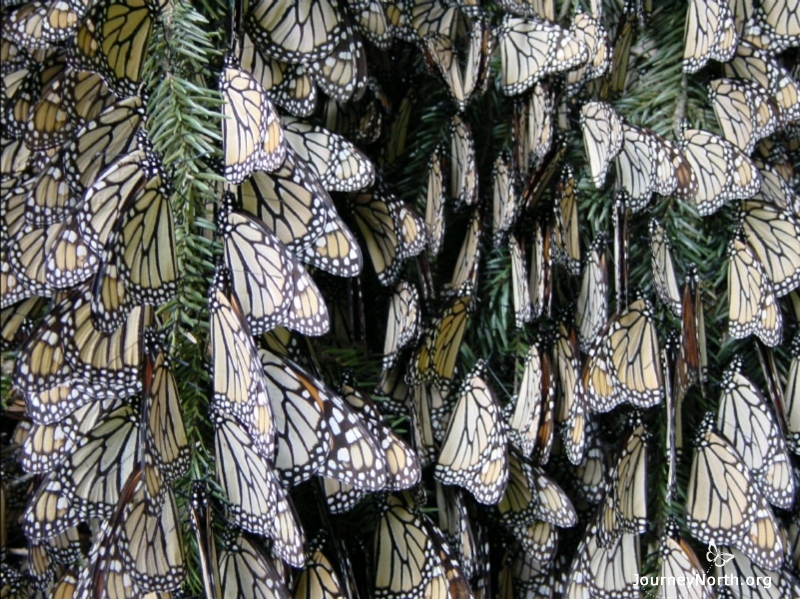 There can be 15,000 butterflies on a single large branch, and as many as 50 million monarchs in one hectare of forest. How might living in a colony help a monarch survive? Bending Branches A monarch only weighs about 500 mg, but a boughful of butterflies can bend a branch. 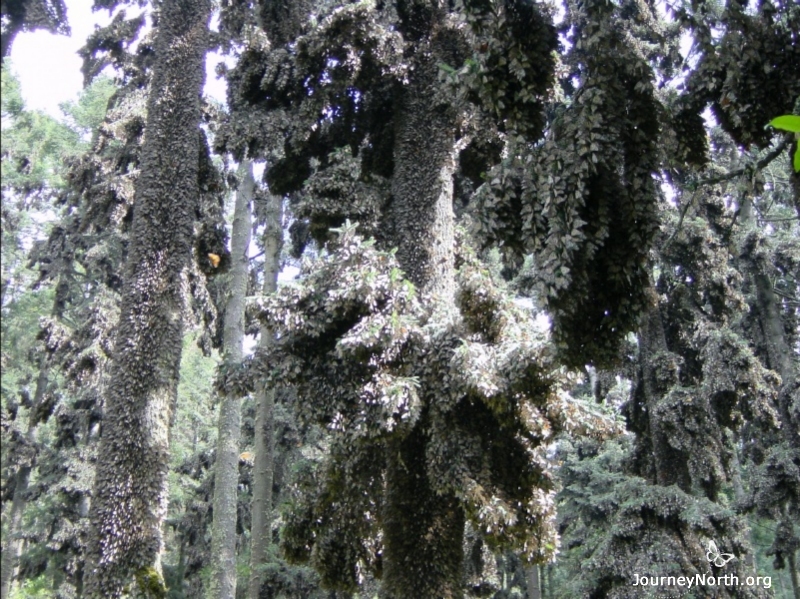 Why do monarchs form their colonies in trees? Paralyzed by Cold When temperatures are cool, the butterflies may not move for hours or even days. 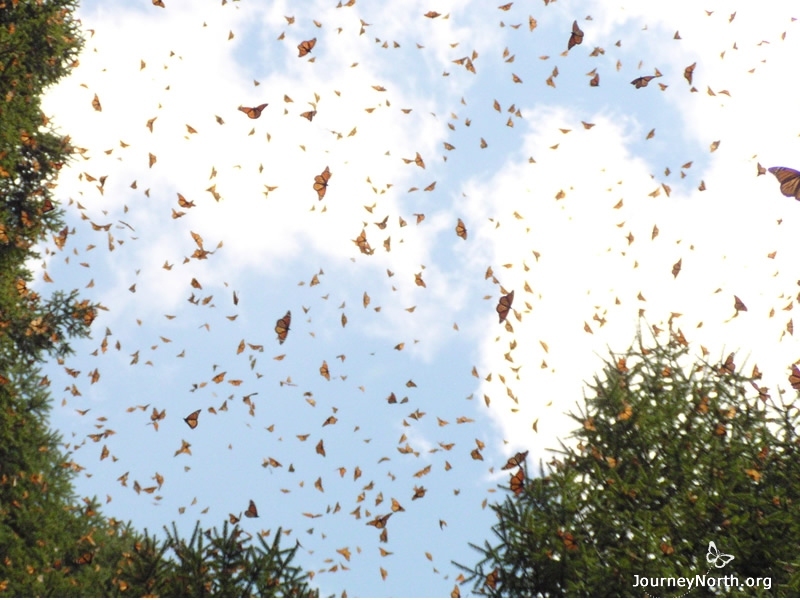 Why do the monarchs migrate to such a cold place? Fallen Butterflies Sometimes a strong wind blows an entire cluster to the ground. It may take several days for them to climb back into their clusters. Why do the monarchs need to get off the ground? Shivering Butterflies The forest floor is often littered with shivering butterflies. Shivering uses a lot of energy. How can shivering help a monarch survive? 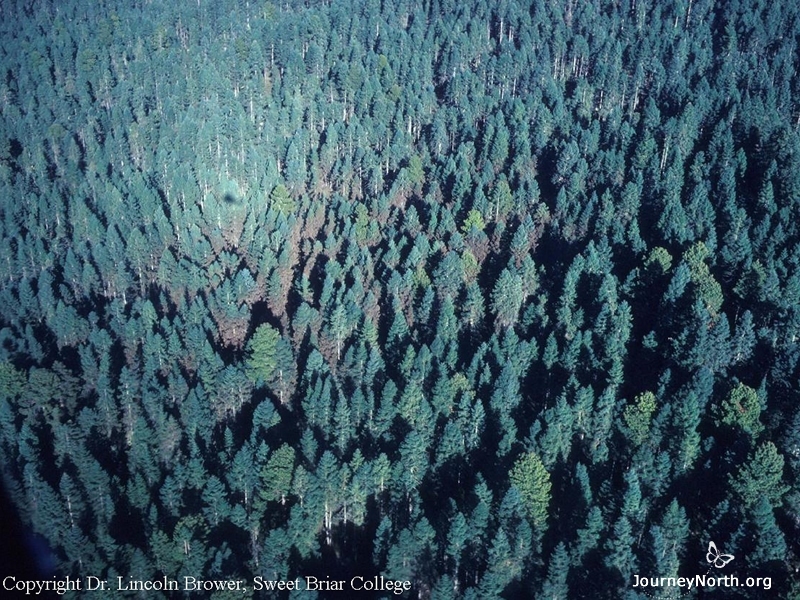 Aerial View Seen from above, the oyamel forest looks spacious. 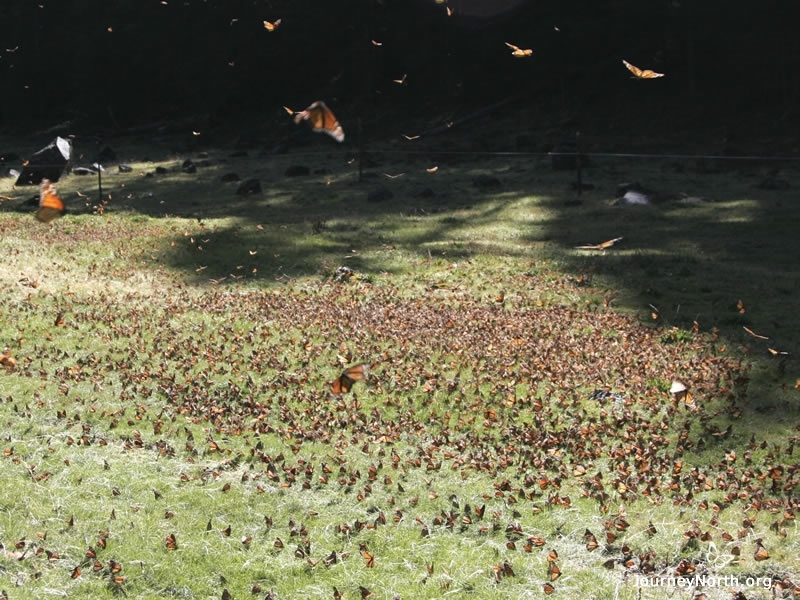 Why do the butterflies concentrate in one area instead of using the full forest? Burst of Flight During moments of sunshine, the monarchs often burst from their clusters. Thousands of paper-thin wings flap, bump and clap. It sounds like light rain. 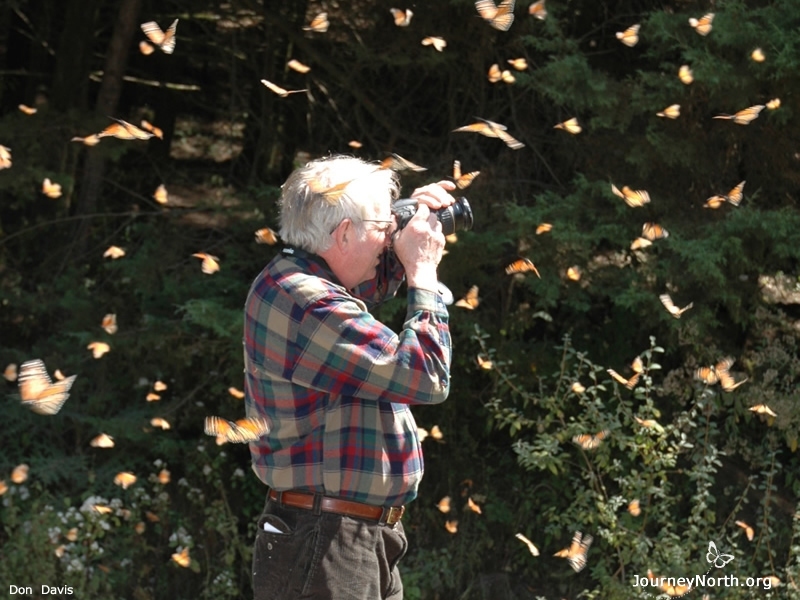 Overwintering monarchs need to conserve energy. Why are they so active? Drinking Dewdrops As the morning frost melts, thirsty butterflies leave their colonies for water. 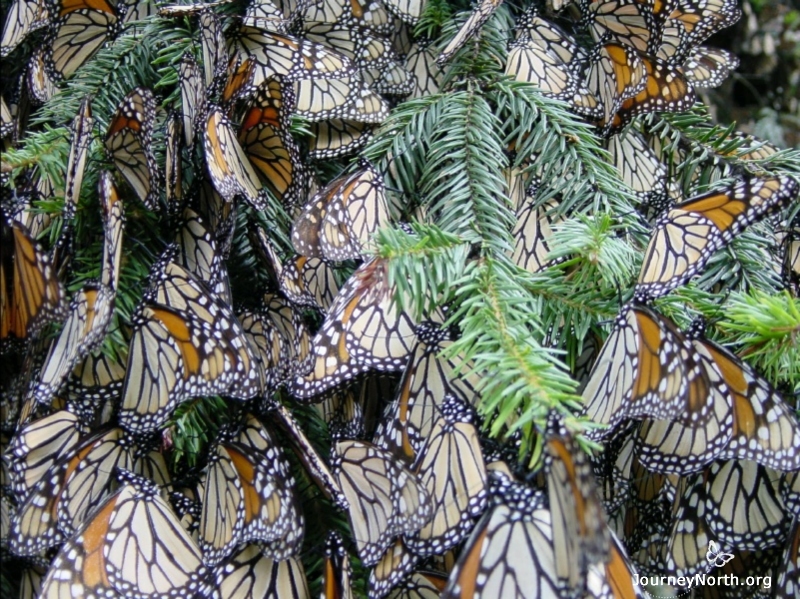 How much water do overwintering monarchs need—and where do they find it? Observe and Wonder Year after year, scientists return to the winter sanctuaries. 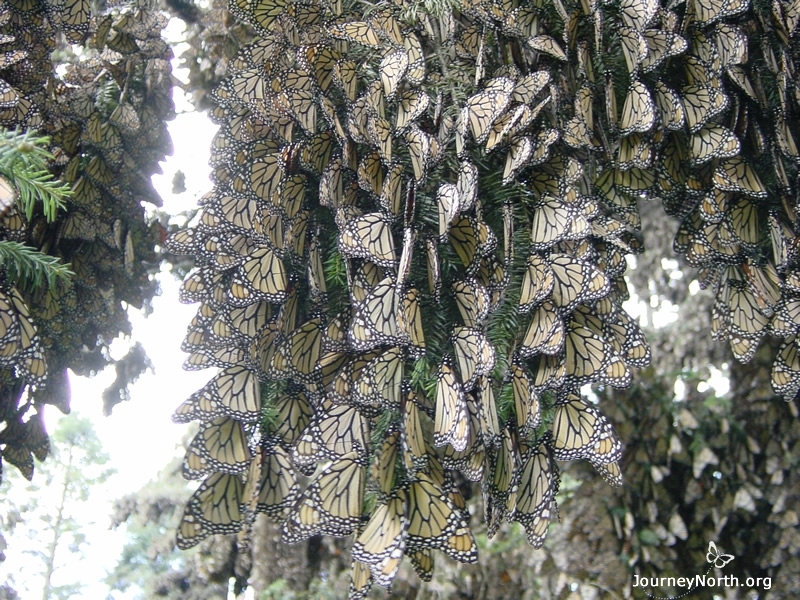 They continue to discover how the oyamel forest meets the monarchs' needs.